This landscape is of a view of the San Juan Mountains from the mountain pass "The Dallas Divide" along the Continental Divide. Fall foliage is one of my favorite natural phenomena. Here in Colorado the golden aspens glow in the bright sun and contrast beautifully with the coniferous trees that weave around the aspen colonies. Set against the massive mountains and the big, blue sky - the sights in September and early October are breathtaking. 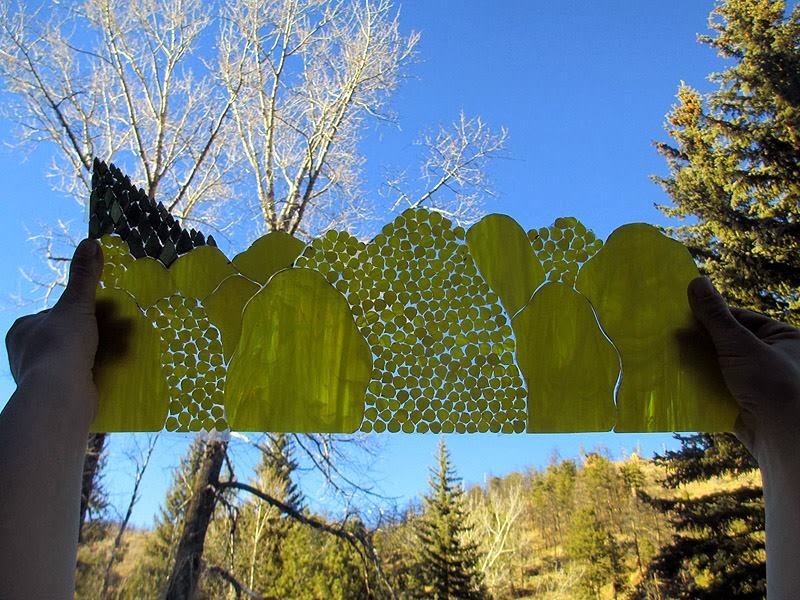 The aspens are done; some are created with larger shapes of glass while others are made with individual little, aspen leaf shapes. Now onto the pines, then the mountains and the sky! 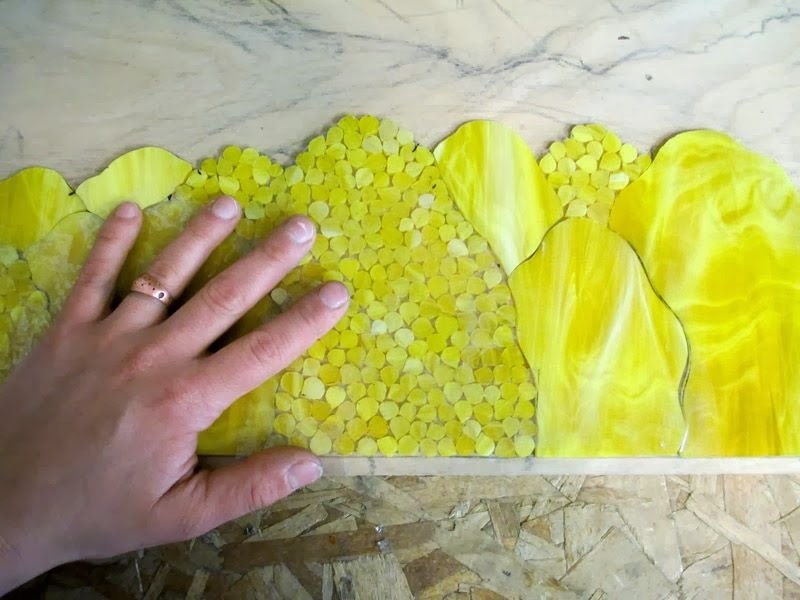 Here is a good size comparison of the little, hand carved aspen leaves next to my hand. Here is one of three sections of pines I added to the composition. 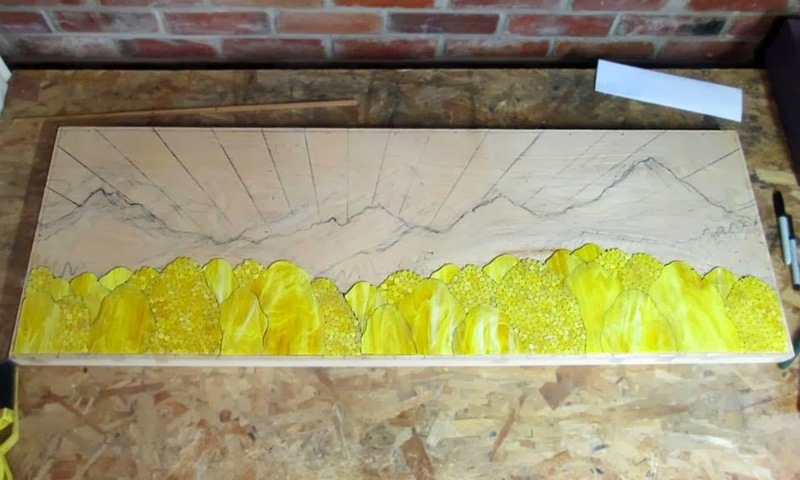 All the little trees are created with the three hand tools seen in the bottom right of the photo. 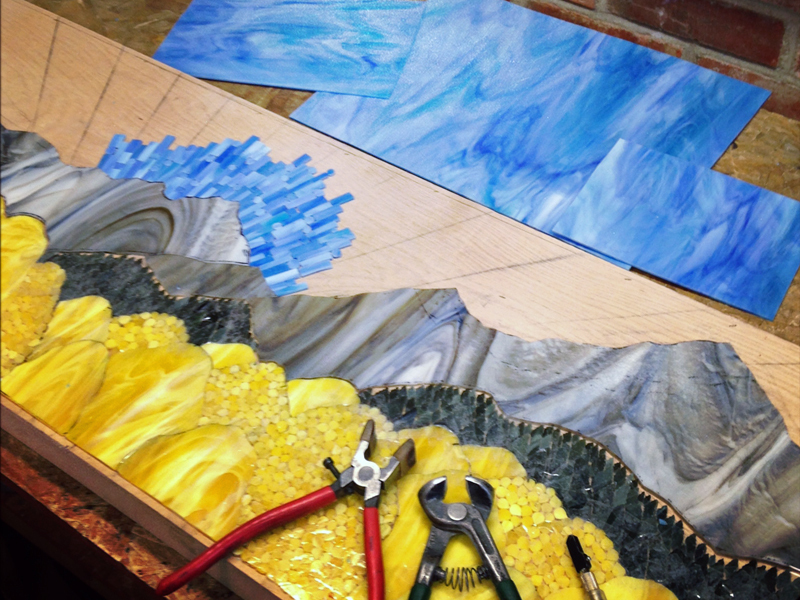 Here you can see one of my freehand cut mountains set against the layers of hand cut trees. 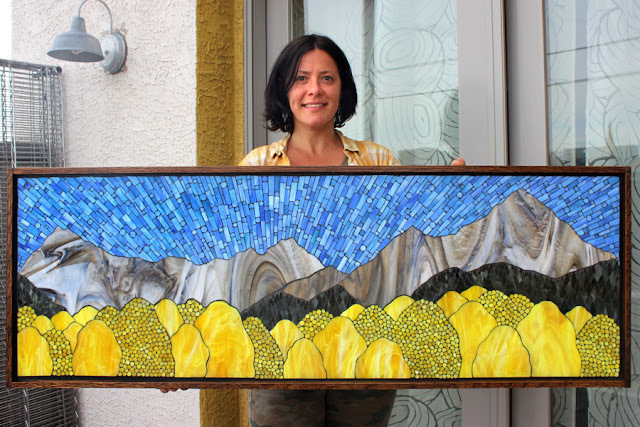 Initially I planned to created the mountains from many, many little rocks that I'd cut out by hand to depict the very, rocky peaks we have here in Colorado but the beautiful patterns in the glass altered my plans. 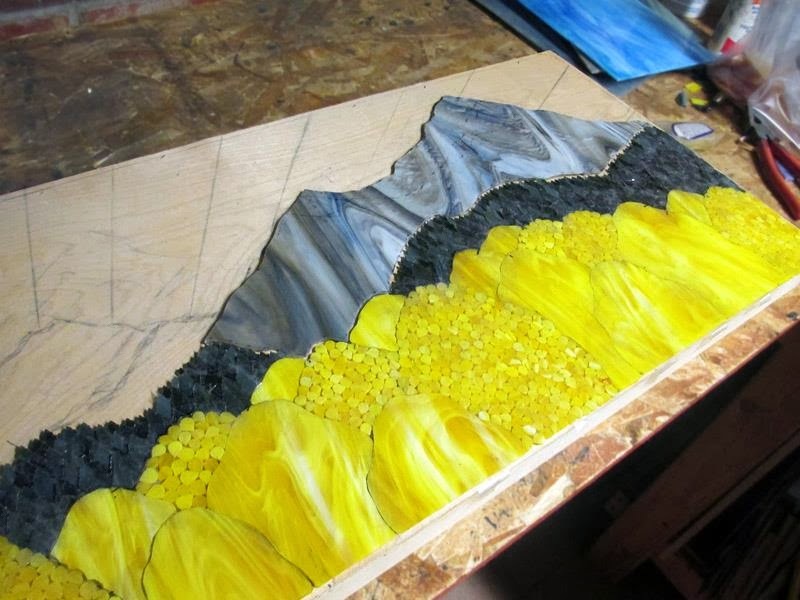 I decided to show the overall impression that all those rocks make together to create the illusion of one solid mountain rather than focusing on the many, many parts that make a whole. 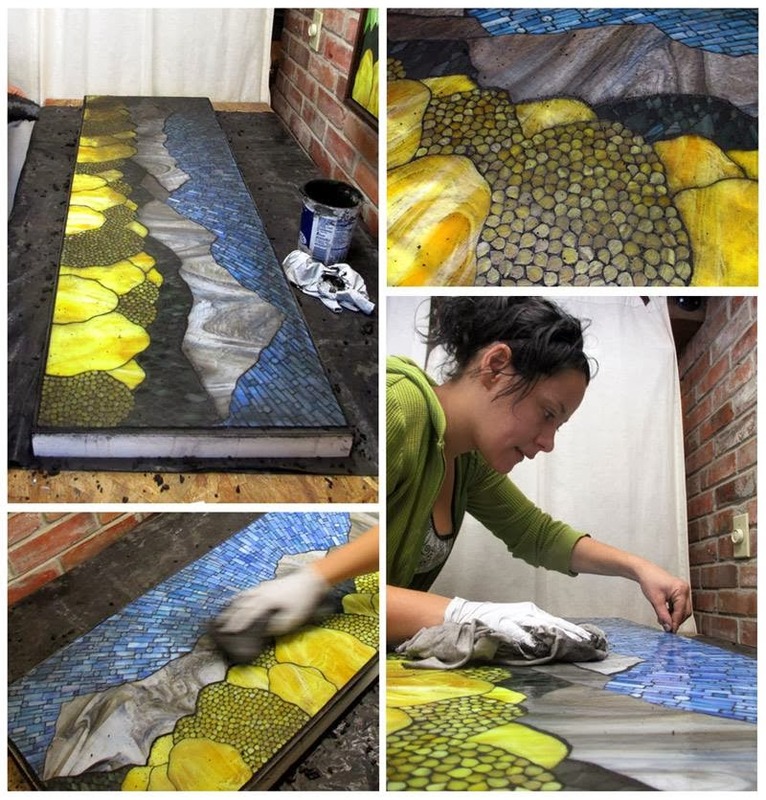 Here I am using the other half sheet of this awesome glass to start the process of creating the mountains on the left side. The blue Colorado sky is coming alive! 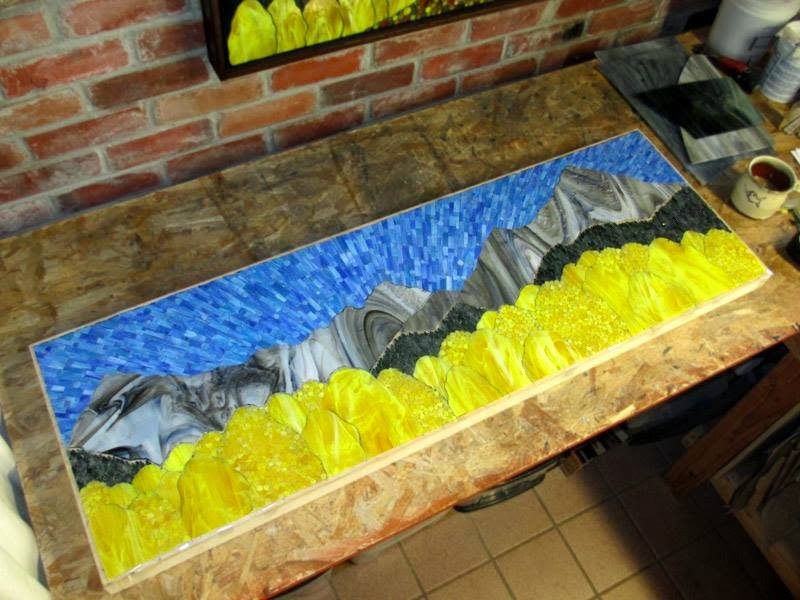 Before sectioning off the taped mosaic for gluing. 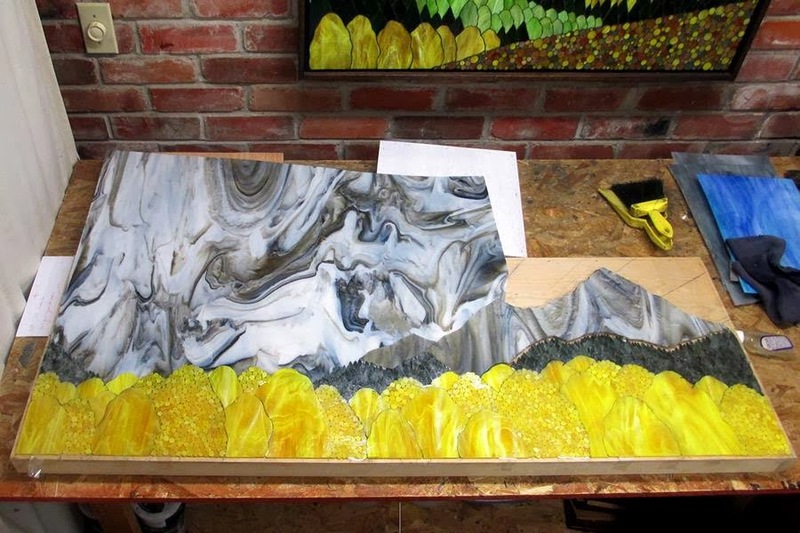 Last but not least, actually my favorite part, is the grouting. 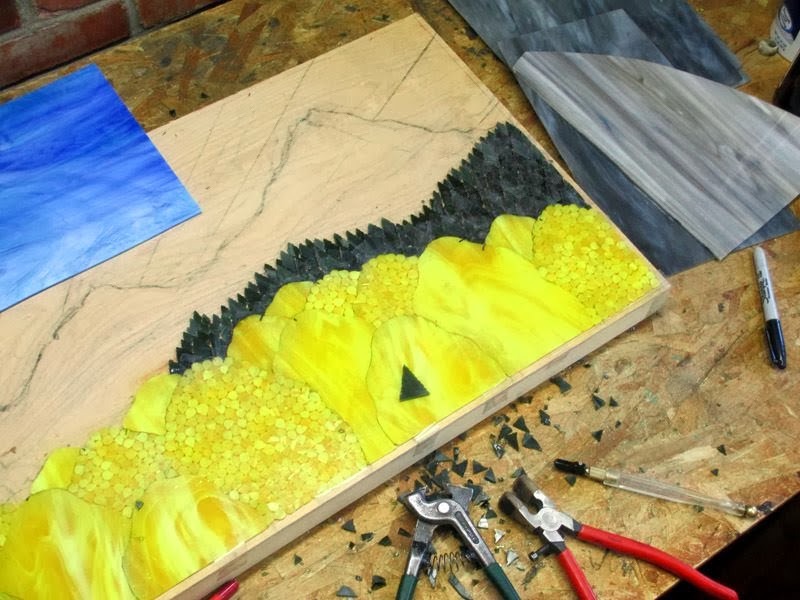 Here I am grouting my mosaics in a sanded charcoal grout. This photo should give you a good idea of scale as people often don't realize how large my landscape mosaics are. 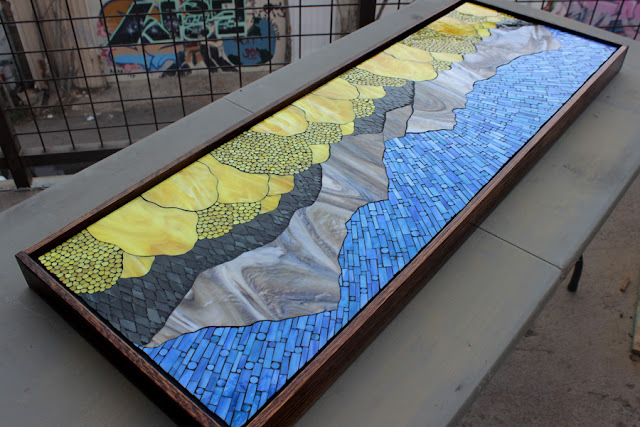 The mosaic is framed in a 1/2" thick and 2.5" deep. The wood used is red oak. It is stained in dark walnut and finished in satin. The frame is smooth to the touch. 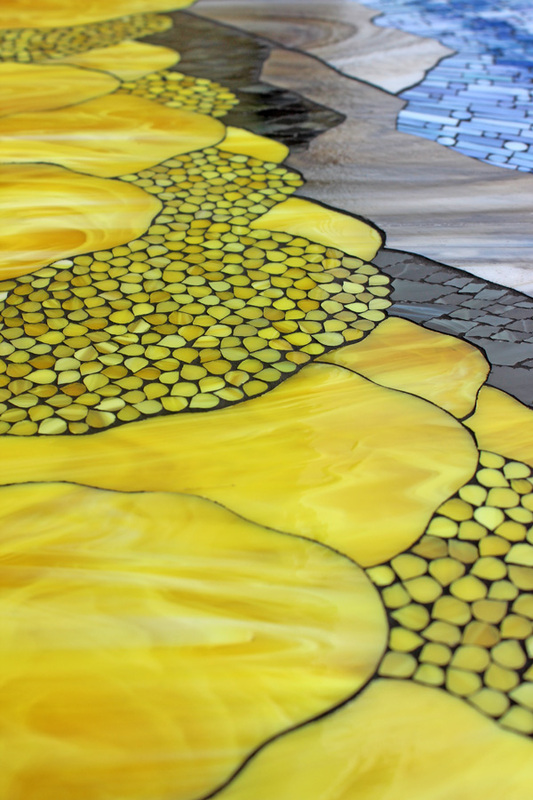 All the glass in this mosaic is completely hand cut including all the large trees, leaves, small pine trees, mountains and every piece of the sky including the circles. An overview of the mosaic in a different light. 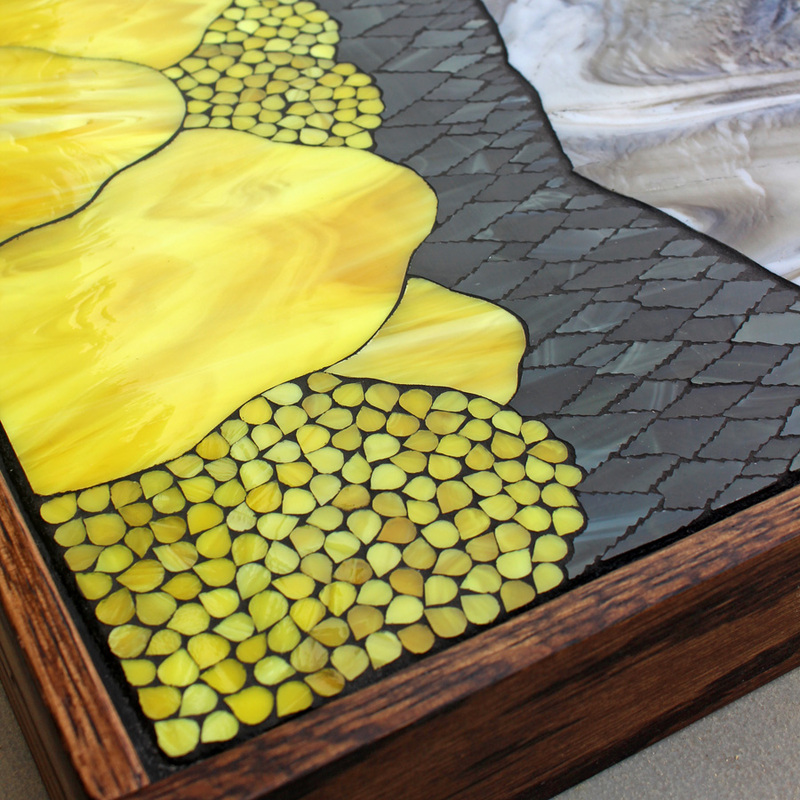 Depending on how the mosaic is viewed, you can see different textures in the glass. Parabéns, seu trabalho é fantástico, muito lindo ! !Adorei visitar sua página e se deliciar com tanta beleza !! Your work is stunning and has inspired me to begin a colourful journey with stained glass/mosaic. I have just found your site! 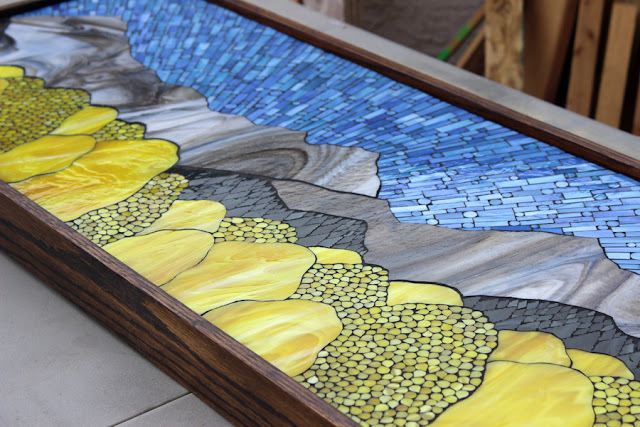 If I want to replace a piece of glass in my house with a lotus design, or a glass tabletop with mosaic do I need a piece a plywood to mount on the glass table and secondly, if I wanted to replace the plain piece of window with stained glass in mosaic (is this possible) how does it all stay together. Mind you, this is Day 1 of journey, and there will be lots of practice before the above is attempted. Thank you for sharing your beautiful art.